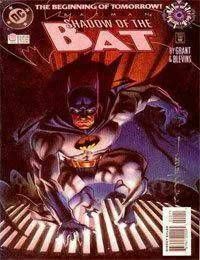 Batman: Shadow of the Bat, was first published in June of 1992, running 94 issues plus a #0 issue and #1000000 issue until it was canceled in February of 2000. It was quickly replaced by Gotham Knights.<br />Started as a showcase for Alan Grant and Norm Breyfogle, (and after a short time just Grant). Once Grant was no longer on the title, the creative teams changed for just about every story arc.<br />For the most part each arc was intended to be self- contained within the Shadow of the Bat series, though much of the book was eventually just used as part of Bat-Family crossovers such as Knightfall and No Mans Land.<br />Brian Stelfreeze provided covers for much of the run.